Whether mapping the deepest ocean regions or the highest mountain summits, people from almost every nation on the planet use GIS to explore and better our world. GIS Day celebrates the many ways GIS software users analyze and solve problems. The ninth annual GIS Day event will be November 14, 2007. GIS Day is a venue for people to share, inside and outside their organizations, why geography matters to everyone. The day is principally sponsored by the Association of American Geographers, Hewlett-Packard, the Library of Congress, the National Geographic Society, Sun Microsystems, the United States Geological Survey, the University Consortium for Geographic Information Science, and Esri. These well-known organizations continue to uphold the vision of this important event, but grassroots-level GIS users are its primary hosts. 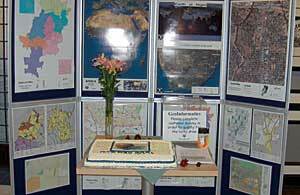 The Corporate GeoInformatics Directorate, City of Johannesburg, South Africa, GIS Day 2006 was a great success with more than 40 participants and included a GIS Day cake. Participants from more than 80 countries have held local GIS Day occasions, such as corporate open houses, hands-on workshops, community expos, and school assemblies. Organizing a GIS event is fun, easy, and rewarding for everyone involved. If you are interested in hosting an event, you can find resources on the GIS Day Web site (www.gisday.com) where posters, PowerPoint presentations, exercises, activities, and videos are available for download. People observe GIS day in different ways. Organizations host open houses, inviting the department staff, local community, and media to see how staff members use GIS in their work environment. Some GIS users provide presentations to local schools, libraries, and museums. Schoolchildren participate in learning through games, geography exercises, and hands-on mapping activities. The classroom is a good place to discuss careers that use geography. Some GIS Day celebrators will display GIS-created posters as a map gallery, locating it in a museum, library, mall, or other public space. Users can volunteer to speak about GIS with local groups, such as social clubs or the city's chamber of commerce. The GIS Day Web site offers many types of support. It is an excellent place to gain publicity. Register an event online, and site visitors can search by area or industry to find it. The site also is a convenient place to post success stories and photos, as well as flyers, agendas, presentations, and so forth. Use the site to acknowledge GIS Day heroes for their dedicated efforts in hosting and volunteering for GIS events. Read and learn about how others held successful events. 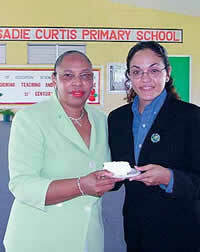 Sadie Curtis Primary School, South Beach, Bahamas, celebrated its first GIS Day in 2006 by learning about local agencies' use of GIS technology and concluded with refreshments shared by the school principal, teachers, and students. The Corporate Geo-Informatics Directorate, City of Johannesburg, South Africa, celebrated GIS Day 2006 with a breakfast for its most valued clients, which included representatives from internal departments, municipal-owned entities, and private businesses. Sadie Curtis Primary School students in South Beach, Bahamas, celebrated their first GIS Day in 2006 by learning about local agencies' use of GIS technology. Danielle Hanek, GIS analyst with the Bahamas National Geographical Information Systems Centre, who participated in the presentations, reported, "Students were amazed that GIS is being used in the Bahamas. Many expressed interest in learning what types of careers exist in the field." The El Paso County, Colorado, Department of Transportation celebrated GIS Day 2007 early with a public works open house in May. Staff showed the public how the Department of Transportation uses GIS technology to serve the public's needs regarding streets and highways. The event included a What Is GIS? presentation, transportation demos, and a mapping exercise on bear and elk sightings in the county. For more information, visit www.gisday.com or contact Caitlyn Mitchell, Esri's GIS Day coordinator (e-mail: cmitchell@esri.com).